Well, it's wedding season again, and I'm guessing it's pretty likely you're all having to get dressed up with some regularity. Maybe you're in all the weddings, or maybe you're just attending. Either way, you've gotta find some shoes that go with as many of those outfits as possible. And guess what! You can! The other day I ran a google search and found out there are a bunch of places online you can design your own shoes. These shoes aren't cheap, but it may just be worth it to finally get the perfect pair that goes with everything! This site has lots and lots of fabrications and shapes. You can choose a color for every single part of the shoe, including glitter! This site has a less attractive image of their shoes, but the pros are that you can choose how each part of your shoe looks. You can choose the type of toe, heel, strap, and platform. This is CAD based as well, so you aren't 100% sure how the shoe will look until you get it, but the cool part about this one is that it's all very visual and intuitive. 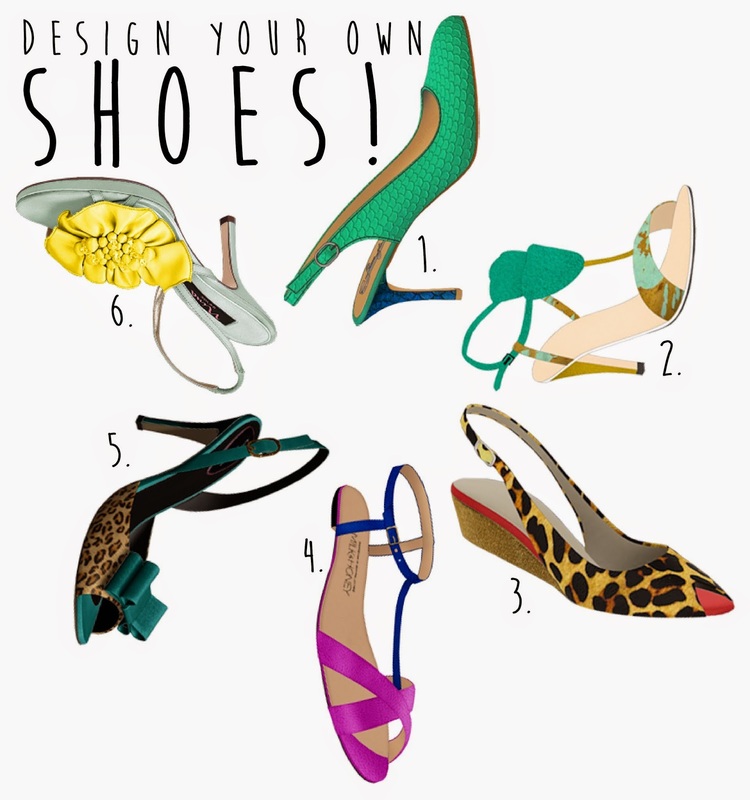 You choose the front, middle, back, heel, and heel height, and you click on each part in order to color it. You can't choose the interior color of your shoe on this site, but I do like that they offer flat sandals and flat shoes. As you can see, I chose flat sandals on this site. And they're pretty cheap compared to the rest of them! This site seemed pretty professional. As you can see, you can also choose to have bows and other little extras. Additionally, the shoes look really realistic when you're finished. You're probably familiar with this brand from shopping in your local department store. Essentially, this site just allows you to recolor Nina styles that have already been created. Still, though, the price seems right, and at least you know what quality of shoe you'd be getting. So, if you're looking for that perfect shoe for wedding season, maybe you should design your own! Enjoy, and happy Sunday!